We have almost made it to the end of the 2012-13 school year and our introduction to the wealth of social media tools that are offered through Gaggle. We got off to a late start and had to play some catch up here and there, but overall I would say that the experience was successful for the students and most of the faculty. As the Gaggle “cheerleader” here at James Weldon Johnson College Prep Middle School, I have learned some good lessons that should help us begin next school year with a powerful start. Here at the end of the year, students are using their Gaggle accounts to sign up for Web 2.0 applications, which they will use for end-ofthe- year projects. They are taking advantage of the email accounts and using them to register for the validation process of many of these apps. They are also collecting email addresses so that they can keep in contact over the summer months. I am encouraging them to keep their Social Walls updated with pictures and posts so that their friends will know what they are doing over the summer. Several students have told me that they will be maintaining their blogs during the summer break also. As the year has progressed, what was novel has lost some of its glamour. The students have grown to think of Gaggle as just one more of their “everyday” tools to use at school. I see this as a good thing. If the students have gotten so used to the application, then they must be using it a lot. As teachers approach the end of this year, they are busy cleaning up their classrooms and they will be cleaning up their Gaggle accounts, too. They will need to clear out any older assignments, emails, discussion boards, and Wall materials. Knowing that they have Gaggle for next year, they are being encouraged to start preparing new information and lessons that can be used in the new school year. They can have much of this up and ready for the students on the first day of school. 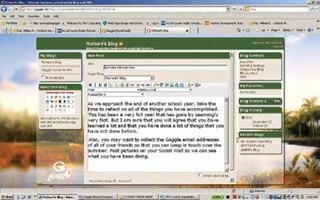 Also, Gaggle has many examples of how to incorporate Gaggle into lessons, including a special group of curricula based on the Common Core curriculum. Our teachers will be encouraged to take some time to examine these and find ways they can incorporate Gaggle into their lessons for this coming school year. I will be preparing a mini-tutorial to introduce the 6th-grade students and any new students to Gaggle when they come to James Weldon Johnson College Prep Middle School next year. Along with this, there will be a parent information letter that will be included in the packet of other information that will be sent to the families during the summer. All of this is our way of prepping and getting things ready for Gaggle to grow and bloom once again in 2013-14. Richard Fair teaches Computer Science at the James Weldon Johnson College Prep Middle School in Jacksonville, FL.